GAINESVILLE, GA—Providing students with hands-on learning in a work environment, Lanier Charter Academy at The Oaks is not your ordinary school. Operating as part of the Lanier Charter Career Center in the Hall County school district, The Oaks offers programs in the culinary arts, hospitality, marketing and promotion, and events planning; its facilities boast a working café, fine dining bistro, conference area, and gift shop to immerse students in the real-life workaday world. Designed by H. Lloyd Hill Architects and Associates, The Oaks is a Gold Medal Winner of the prestigious Building of America Award. Its acoustical make-up and extensive audiovisual system was designed and integrated by Gainesville-based dB Audio & Video. The system includes a centralized audio system, distributed video, digital signage, lighting, and control automation. “The audio system in the classroom spaces and other areas of the building needed to work autonomously, but in zones as well,” explained Neil Philpott, systems advisor at dB Audio & Video. The same applied to the video system: “The video had to be capable of working for each individual room, but, through a master routing system, it had to be able to combine multiple rooms as well as accommodate videoconferencing.” This is to accommodate not only distance learning applications, but videoconferencing for teachers that are located throughout the district as well. The conference center offers a number of different physical room configurations thanks to its divisible walls. Each space within the configuration is equipped with a camera system that feeds composite video and audio to a DVD recorder. To distribute these signals, dB Audio & Video installed FSR ’s Room Navigator RN -410CA 4x1 video/audio distribution amplifier to monitor switching. This unit is controllable remotely via RS -232, or via the front panel. Additionally, FSR ’s RGB-4 1x4 ultra-high resolution and ultra-high bandwidth distribution amps distribute the camera feeds to overflow digital signage in the foyer and hallways surrounding the conference center. (Top) FSR’s RGB-4 1x4 distribution amps distribute camera feeds to overflow digital signage in the foyer and hallways surrounding the conference center. (Bottom)The conference center offers a number of different physical room configurations thanks to its divisible walls. 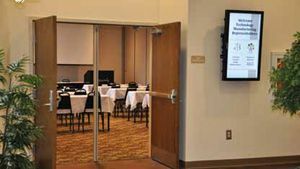 Crestron provides control of the audio, video, and lighting systems throughout the facility; some areas, such as the teaching classrooms, are fitted with CNX-B12W 12-button button panels while other areas feature Isys wireless touchscreens. The system boasts the manufacturer’s DigitalMedia technology, Philpott explained. “Digital Media is throughout the entire building; every room has Digital Media inputs on the wall, as well as all of the rack-mounted sources that are available, and that includes the videoconferencing systems that are in the main head-end racks,” he said. Philpott noted that the Hall County school system is placing increased emphasis on the incorporation of high-tech systems into its facilities. “One of their goals is to take all of Hall County schools into that next generation of technology-based learning,” he said, adding that the objective is not only to provide interactivity between students and these systems, but between each other as well.